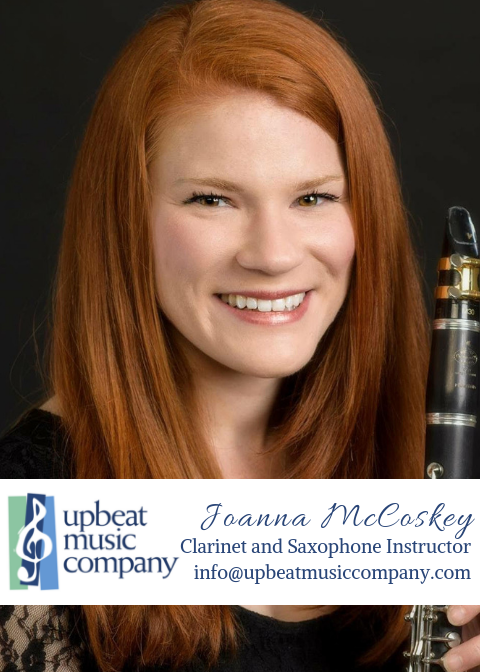 Joanna McCoskey is a clarinetist, teacher and conductor based in Winston-Salem, NC. She currently works as a clarinet instructor at the UNCSA Community Music School in Winston-Salem, Upbeat Music Company in Lewisville and maintains an active private studio. In addition to her work as a clarinet and saxophone instructor, she is also an active performer in the Piedmont Triad. She has played with Piedmont Wind Symphony as a section clarinetist, the Salem Band as a section first clarinetist and Eb clarinetist, and Salem Saxophone Quartet as a tenor saxophonist. She has also participated in multiple local pit orchestras in addition to being first call clarinet substitute for the Durham Symphony Orchestra. Her other work includes serving as the conductor of the New Horizons Bands of Winston-Salem and Greensboro (https://newhorizonsmusic.org/). Joanna received her training at the University of Delaware (UD), where she received M.M. degrees in Clarinet and Wind Conducting Performance in 2018. Prior to returning to school for her Master’s, Joanna was a middle school band director at Seaford Middle School in Seaford, DE. She also received her B.M. in Music Education from UD in 2014. During her time at UD, Joanna served as the principal clarinetist of both the Wind Ensemble and Symphony Orchestra, along with conducting the UD Collegiate Band, Wind Ensemble, Symphonic Band and Clarinet Ensemble.